In today’s advertising rich environment, you need content marketing regardless of whether your organization is a B2B, B2C, Not-for-Profit or solopreneur. The one big reason is trust! Beyond the fact that content marketing powers social media, search and sales, marketers must use content marketing because consumers don’t trust advertising. This isn’t a newsflash. While advertising credibility has been on the decline for years, recent Nielsen research link underscores this continuing trend. Even more alarming for marketers looking to reach shoppers on-the-go, potentially in your store and ready to purchase is the fact that mobile and social media platforms have the lowest levels of consumer trust. According to Nielsen about a third or less of customers surveyed had confidence in these advertising formats. Interestingly, advertising in older media formats such as television, newspapers, magazines, movies and billboards yielded higher levels of trust in the 40% to 50% range. It’s as if age of media platform translated to trust. So how do you distribute your marketing message without advertising? Content marketing is the antidote for consumers’ lack of trust in advertising. Nielsen’s research found that consumers thought content marketing in the form of email, company websites and editorial content was more credible than advertising. Unlike advertising, content marketing is void of promotion so there’s no sell, sell, sell. It uses a human voice and relates information and answers customers seek, enhancing its credibility. Want to take your message’s reliability up a notch? Add customer reviews and social sharing to your content to enable customers and the public to share their opinions and your content. This is important because customers trust other customers and their family and friends more than your marketing. 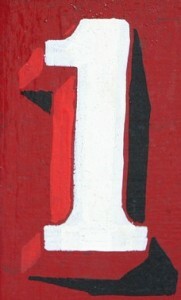 Another way to increase your message’s credibility is repetition. Based on Edelman’s 2012 Trust Barometer, consumer skepticism translates to the your target audience’s need to receive your message three to five times before they believe it. Bear in mind that roughly one fifth of those surveyed required more than five repetitions. Compared to Nielsen’s findings, Edelman’s research showed consumers’ trust of media at lower levels. Interestingly the biggest jump was for social media. But don’t rush to shift your advertising budget without taking a closer look. 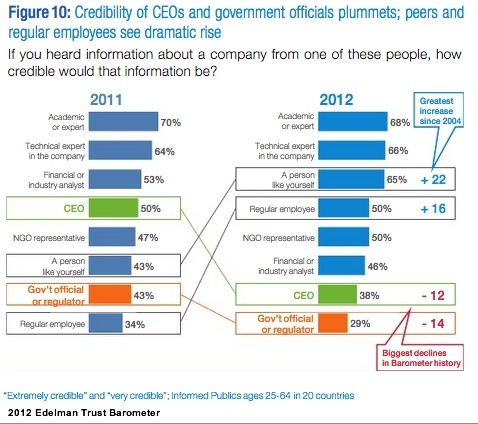 While trust of companies on social media grew 75% since 2011, it’s still only 15%, which is a very low level. This is attributable to the fact that people are on social media to socialize and don’t necessarily believe that firms are transparent in their activities. To better position your content marketing’s integrity, use Edelman’s findings to guide your content creation. When it comes to building trust, understand that it takes time just as it does in real life. You need to take one step at a time. 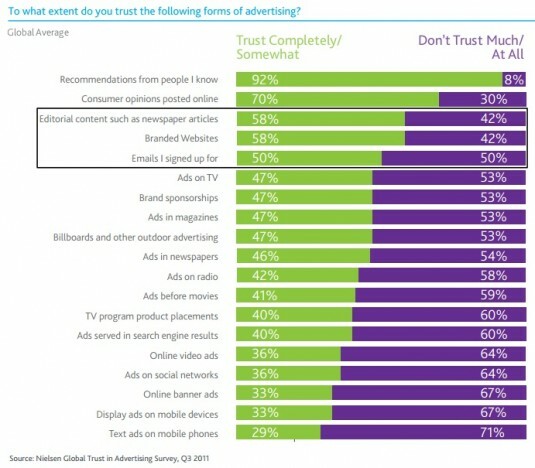 Tags Advertising, Edelman trust Barometer 2012, Nielsen, Trust. Bookmark the permalink. What a great article! Thanks for sharing. Do you believe content marketing is different from article marketing? The latter is of course less preferred as it sounds like filling the web with plr articles.